There are many tarots but as we go back in time the ancient tarots become more rare. This section presents some of these tarots that I consider the most accomplished and/or the most surprising. Stewart S Warren, who has already published poetic collections on two magnificent ancient tarot decks, now presents us with his latest work, “Powers & Patterns” the fruit of his inspiration on an exceptional tarot, the Tarocchi del Mantegna. The Tarocchi del Mantegna is a very unusual tarot, compared to the too few ancient tarots which have survived the ravages of time. In this 15th century deck, we find neither the usual structure of 22 arcane majors nor the four series of minors. Those readers familiar with the tarot of Marseille may at least recognise some familiar cards such as the Emperor, the Pope, Temperance, Strength, Justice and the Moon and the sun . It is to be hoped that readers are not put off by this aspect of the Mantegna. 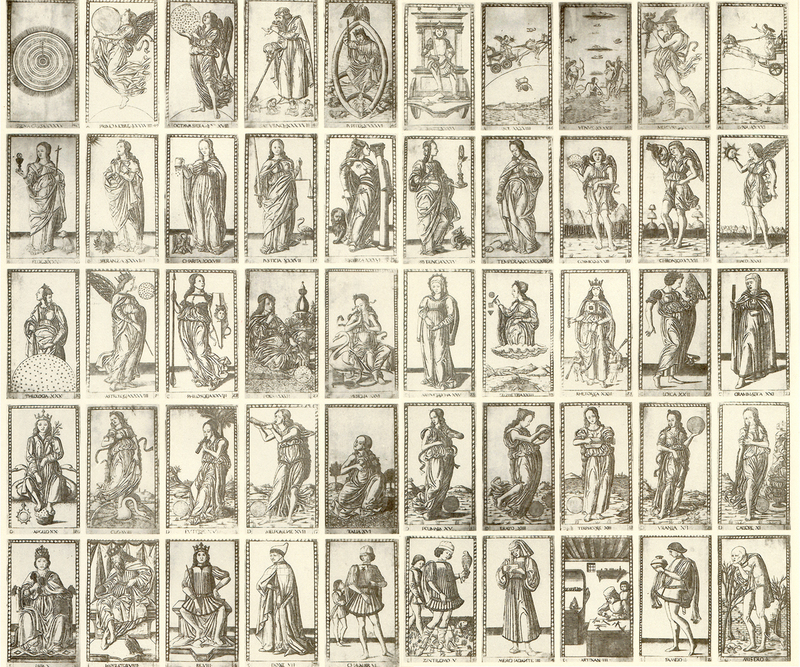 Therefore, rather than being discouraged by this aspect, it is hoped that the curious scholar will marvel at this surprising succession of fifty cards, which start with MISERO, a poor man in rags leaning sadly on his stick, and ending with PRIMA CAUSA, an image of the ancient cosmogony where the earth is the centre of the universe. Faced with such a succession of cards, surprise gives way to delight. Right from the start, we discover a social hierarchy in the first ten cards. The miserable beggar – the lowest condition – is followed by the servant, the tradesman, the merchant, the gentleman, the knight, the doge (or first magistrate), the king, the emperor and the pope at the height of the human hierarchy. The ascending and descending aspect of this hierarchical succession is a fascinating discovery: the pope has certainly the highest function which is the most difficult to obtain, contrary to the beggar whom fate has thrown into the dirt, but who represents the immense majority of humanity, whereas there is only one pope ! These first ten cards show us not only a representation of the caste system, and allow us to contemplate an elevation by merit on the terrestrial social ladder; but also the opposite mechanism, the idea of karma: regression due to misbehaviour. Here we find one of the profound mysteries of this tarot, because apart from the first arcane, MISERO, is it not an idyllic representation, as it evil didn’t exist? It is necessary to imagine a kind of reversed Mantegna tarot, where a virtue expresses its opposite. Thus the tradesman suggests its antithesis, bad workmanship ; the king, the tyrant ; the pope, the antipope ; and so on for all the cards, except, without a doubt, for the last two, unalterable. However “Le Monde” (the world) is not just a mundane social ascension or its opposite. This tarot is not limited to the first ten cards, and from the cards XI to XIX, we find a series of nine muses. These muses appear to represent that which inspires man’s soul, what makes him greater and what fleetingly reveals his own divinity. Then the twentieth card reveals Apollo, mediator between the gods and man, who brings the Olive branch to the world. It is Apollo who introduces us to the Sciences, with the next 10 cards, and we notice that the ancient scientific hierarchy is respected because Astrology and Theology are respectively the twenty ninth and the thirtieth card, the last two of this series of ten. This progression continues with the cards XXXI to XXXX where we can see the ten emotional and intellectual qualities which allows man – homo sapiens- to live, control and progress in the social dimension of human life. It would be more accurate to say nine emotional and intellectual qualities because this series of ten cards finishes with FEDE, Faith, which is an intrinsically spiritual quality. Thus this card XXXX introduces the last series of ten cards, a cosmic and super- human series, with the seven planets of the antique world, or its occult equivalence, the seven planetary regents ; then OCTAVA SPERA, the superior heaven, ” the World of the Devine Spirit, without form”; then PRIMO MOBILE or Fohat, “The living Force created by WILL” ; and finally PRIMA CAUSA, the eternal cause, or ” He who cannot be spoken about”. Can we imagine a more intriguing journey than that offered to us by the Tarrochi del Mantegna, an initiatic voyage where through fifty stages we experience the expanse of divine creation? By sublimating matter and unifying the earth and the heavens, where “what is up high is like what is down below and what is down below is like what is up high”, this exceptional tarot invites us on a transcending journey. With Powers and Patterns, Stewart S. Warren, an admirer of beautiful tarots, invites us to discover the Tarocchi del Mantegna, guiding us poetically through the fifty steps of this cosmic temple. Through rhythms and rhyme, we become immersed in a universe of unspoken messages, represented by the images of the tarot. We linger on the questions that it raises, and on the infinite mysteries that the card, seemingly a closed and finite universe, conceals.